Oil prices have been above $28 a barrel for a long time. Yet those high prices haven't spurred greater demand for offshore support services. That mystifies suppliers of those services. Rising oil prices are setting records for fuel costs in the U.S. and elsewhere. 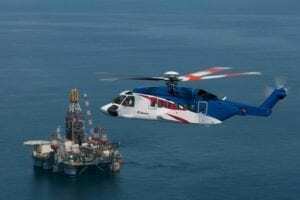 But the boom in per-barrel prices has yet to produce an upturn in exploration and production companies' demand for offshore support from helicopter operators. Conventional wisdom holds that exploration for new wells and extraction from old ones deemed less than productive picks up when per-barrel prices approach $28. Prices have been above that level for nearly a year, and in late March were nearing $40 a barrel. Yet offshore support companies report that demand for their services is languishing. 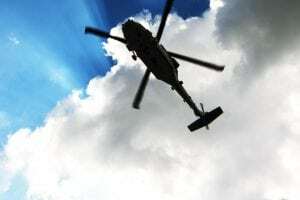 "Everyone's waiting for an uptick, but it hasn't happened yet," said Lance Bospflug, president and CEO of Petroleum Helicopters, Inc. "It's kind of mystifying." That concern extends beyond the Gulf of Mexico. It is shared, for instance, in the North Sea. "There is a real nervousness in the northeast of Scotland that after a long, sustained run of high oil prices, we still are not seeing the kind of activity we would expect," said Sir Robert Smith. He is a Liberal Democrat member of the United Kingdom's Parliament who represents a district in and around Aberdeen. As energy exploration and production industry leaders gather in Houston this month for the annual Offshore Technology Conference, offshore support operators are struggling to understand where their market is heading. Bospflug and others said their customers seem reluctant to invest in more offshore support until they get clearer signs that the U.S. economy has stabilized and is beginning to recovery from its three-year-old downturn. Bospflug spoke as crowds swarmed around him at March's HAI Heli-Expo 2004, during ceremonies marking Sikorsky's delivery of the first S-92, to PHI. As such, he personified the predicament facing the offshore support sector. 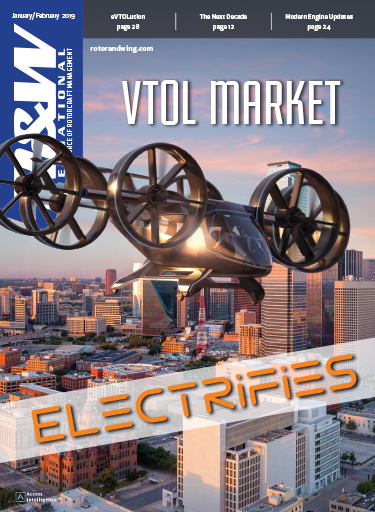 As these operators try to decipher the causes and likely duration of the energy companies' reluctance to increase business with them, they are entering a period in which they will need to replace many older aircraft in their fleets. They also would like to need to expand those fleets. Tex-Air Helicopters is a case in point. The subsidiary of Seacor Smit is in the process of taking delivery of 10 Agusta A119 Koalas. It accepted its fourth at Heli-Expo. "We're building our fleet in a big way," said Jamie Plowman, the Houston, Texas-based company's director of marketing. "We'd like to see better activity in the Gulf of Mexico." Sikorsky's development of the S-92 was timed in part for the aircraft to enter service early in this offshore support acquisition cycle. Bell Helicopter and AgustaWestland had the same goal in developing the AB139. The first AB139 was delivered to its launch customer, Italian operator Elilario, at the end of 2003. Bell Agusta Aerospace officials aim to gain FAA certification within a few months. 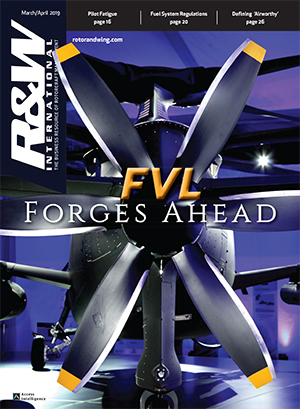 Indeed, industry forecasts peg offshore support as a small but key source of future aircraft acquisitions. The latest assessment by engine maker Honeywell forecasts that those operators will spur helicopter purchases for the next several years. The sector's share of future purchases rose two percentage points, to 10.6 percent, when compared to last year's forecast. Honeywell attributed that rise to expectations that higher oil prices will increase aircraft purchases. But most of that demand will come from operations in Asia, Africa, and the Middle East, Honeywell said, with those regions collectively accounting for 31.5 percent of expected offshore purchases. Europe should account for 11.3 percent. 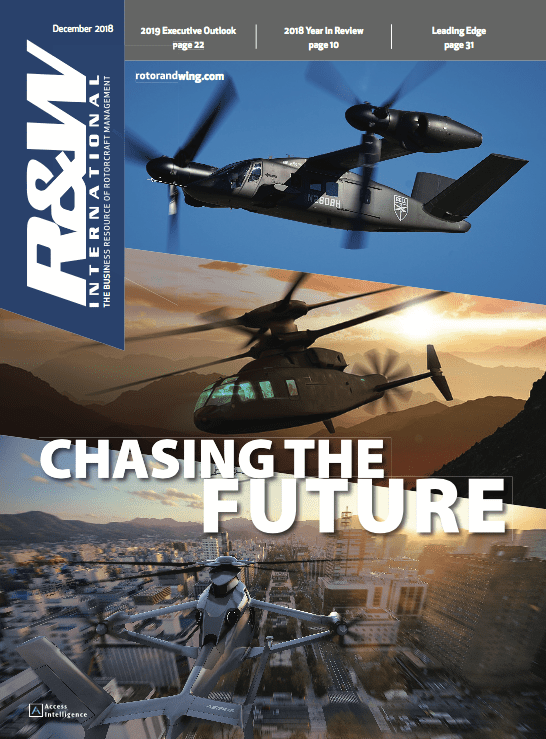 Honeywell's survey sees "only limited demand for new offshore oil support helicopters in the Americas" over the next 10 years. As Honeywell's data indicates, the tepid offshore markets in the United States and in Europe's North Sea are causing support companies to look elsewhere for business. Markets in Asia, West Africa, Brazil and the Middle East are busy or hold promise of becoming so. The North Sea continues to slump, with 1,200 drilling jobs alone lost in the last year and offshore operators like CHC Helicopters and Bristow Helicopters cutting staffing in the region. Both companies are reorganizing and streamlining their operations there. Bristow's flight hours fell as much as 20 percent in the region last year. Bristow CEO Keith Chanter has said the company is focusing on expanding offshore support operations to areas outside the North Sea. Key areas of interest are the former Soviet Union, Africa and Latin America. "We have got to move from the North Sea," he said. The company also has joint ventures with partners in China, Nigeria and Australia. CHC Helicopter is pursuing a similar course. It recently wrapped up a complete acquisition of Schreiner Aviation Group of Hoofddorp, the Netherlands, for a cash payment of about 83 million Euros ($101 million), including all outstanding debt. Schreiner operates a worldwide fleet of about 50 aircraft, providing helicopter and fixed-wing aviation services primarily to the offshore oil and gas industry in Europe, Africa and Asia. Its annual revenues are about 100 million Euros ($122 million). The CHC Helicopters International division won a two-year renewal of a contract from PTT Exploration and Production in Thailand to provide two Sikorsky S-76A++ helicopters. That division also won a contract from Canadian Superior Energy Inc. to provide helicopter and other related flight services supporting the initial drilling program of the Mariner natural gas project offshore Nova Scotia. CHC Helicopters (Africa) won a five-year contract renewal (with a one-year option) from Mobil Equatorial Guinea Inc. to dedicate two new S-76C+ aircraft to support operations off the coast of West Africa this year. The aircraft will be based at Malabo, Equatorial Guinea, replacing two Bell 212s on the contract. Still, there are some bright spots in the North Sea. ExxonMobil is increasing production of its Ringhorne field in Norway. 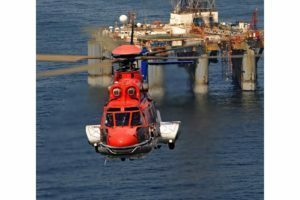 CHC Helicopter's European division in January won a three-year, $34-million contract from Eni UK, BG Group and ConocoPhillips Petroleum for flights to and from North Sea drilling rigs. 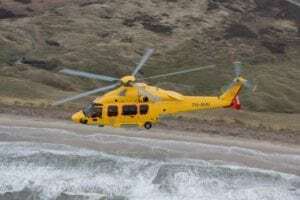 It includes a two-year extension option and will use Super Puma AS332Ls operating from CHC's Aberdeen base. Also, the Canadian company Oilexco has reported finding an oil field 120 miles off Scotland's Moray coast that appears to be seven times the size of most North Sea finds. The Brenda field could hold reserves of 150 million barrels of oil or more, the Calgary, Alberta company said. Experts put the average size of a find in the region at 20 million barrels. In the Gulf of Mexico, federal officials continue to push for deeper wells and for more deepwater wells. "Deepwater oil and gas development in the Gulf continues to be the workhorse of U.S. domestic oil and gas production," said Johnnie Burton, director of the Minerals Management Service. That service is the federal agency that manages oil, natural gas, and other mineral resources on the U.S.'s Outer Continental Shelf. He said a record number of drilling rigs are at work in ultra-deepwater in the Gulf, including 12 drilling for oil and gas in 5,000 ft. of water or more. Deepwater oil production in the Gulf rose 535 percent between 1995 and 2002, and deepwater gas production climbed 620 percent. Six new oil and gas discoveries were reported in 5,000 ft. of water or more in 2003. This year, 61 production facilities are expected to be on line at deepwater sites in the Gulf. But U.S. officials are anxious to promote more production, especially of natural gas. Their efforts are driven by concerns that U.S. demand for natural gas is projected to increase by 42 percent over the next 20 years. Americans use 22 trillion cubic feet of natural gas per year. To promote more gas production, federal officials launched another round of incentives, offering to suspend royalty payments on drilling aimed at recovering gas from hard-to-reach areas of the Gulf. The incentives cover deep gas accumulations in water depths less than 656 ft., and 15,000 ft. below the Continental Shelf. The government will suspend royalties, for instance, on the first 15 billion cu. ft. of gas produced from depths greater than 15,000 ft. and on the first 25 billion cu. ft. produced from 18,000 ft. or deeper. It also offered a credit against royalties for a well drilled 18,000 ft. or lower that comes up dry. There does remain interest in the Gulf of Mexico. A mid-March auction of leases by the Minerals Management Service brought in nearly $370 million in high bids from 83 companies for tracts off Alabama, Louisiana, and Mississippi. The number of bids-829 on 557 tracts-was the highest for tracts in that area in six years, which Burton called "a clear indication of industry's continued confidence in the Gulf." On reason for the reluctance Bospflug and others are observing in energy companies could be the risk of deep drilling. One Canadian company, Nexen, reported in February that a well it had drilled with Royal Dutch Shell had come up dry. At 26,000 ft., the well is among the deepest in the Gulf. It had cost $35 million to drill. 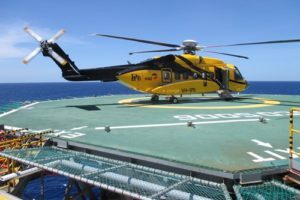 As the aspirations of CHC Helicopter and Bristow and Honeywell's aircraft sales forecast indicate, exploration and production is picking up in markets other than the Gulf and the North Sea. Companies are making huge investments in Asia and the Middle East and investigating the promise of Brazil again. In Kazakhstan, for instance, companies are spooling up to develop the Kashagan oil field in the Caspian Sea. Last February, ConocoPhillips and its partners in the North Caspian Sea Production Sharing Consortium, along with the petroleum authority of the Republic of Kazakhstan, approved the development plan for that field. The partners estimate the field could produce up to 13 billion barrels of oil, which makes it one of the largest discoveries in the last 30 years, according to industry officials. Initial production from the field is targeted at 75,000 barrels a day by 2008. Subsequent phases are planned to bring production to about 1.2 million barrels of oil per day. ConocoPhillips said the capital investment to fully develop the field is estimated at $29 billion; the first phase is expected to cost $10 billion. In the Russian Far East, development continues on the second phase of the major oil fields off Sakhalin Island, in the Sea of Okhotsk. The Piltun-Astokhskoye field (oil with associated gas) and Lunskoye field (predominantly gas) are estimated to contain more than 1 billion barrels of crude oil and more than 8 trillion cu. ft. of natural gas. Production at the existing phase is limited to about 180 days a year. The sea around the fields are covered with ice for the remainder of the year. The goal of $10-billion Phase 2 is to permit year-round oil and gas production. It is the largest single foreign direct investment project underway in Russia. The project is run by Sakhalin Energy Investment Company Ltd., whose shareholders include Royal Dutch/Shell, Mitsui and Co., Ltd. and Mitsubishi Corp. The project also involves about $300 million worth of upgrades to Sakhalin's roads, bridges, railways, airport and port. In Brazil, there are believed to be many large, unexplored oil fields with the potential of holding a billion barrel of oil. Of particular interest are the Campos Basin and other ultradeep offshore areas. That basin is estimated to have oil reserves of 8.4 billion barrels. Brazil is a market that has been opening up in recent years. According to oil industry officials, only one company-the Brazilian state-owned Petrobras-operated there in 1998. Now more than 40 do, including independent exploration and production companies like Kerr-McGee and Newfield Exploration. Still, the market is restrained by cumbersome Brazilian regulations on the local content required on major business projects. In Iran, authorities are pursuing development of the huge South Pars offshore gas project. U.S. companies have been locked out of the bidding for that project, which is intended to extract gas reserves from the field in the Persian Gulf. Iran is estimated to have about 16 percent of the world's gas reserves. Its roughly 812 trillion cu. ft. is second only to Russian. The South Pars project aims to recover 8-10 percent of those reserves.